X-hyp proposes two free demos you can use within QEMU. If you do not know QEMU visit the site at http://www.qemu/.org, QEMU is an emulator created by Fabrice Bellard and which code is used by most of the free hypervisors like virtualbox, xen or kvm. X-hyp do not use QEMU code but the demos use it as an emulator to allow you to run X-Hyp without having appropriate hardware. Of course you can not make any latency measure inside of the QEMU emulator. Follow the link to the binary demos to learn how to download and use the pre compiled free demos with POSIX or ARINC scheduler inside of QEMU. Configure X-hyp domains, and add pre-built partitions like one or more FreeRTOS or standalone demos and one console driver partition. Doing this you should use our easy to use Xhyp configuration tool. Built your own domain, using our standalone demos as a skeleton you may developp your own domain and schedule it along with a console driver partition and one or more FreeRTOS. 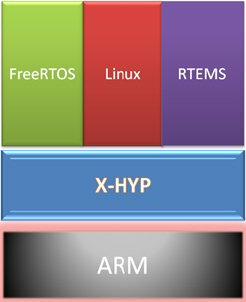 Built your own FreeRTOS application, using the FreeRTOS application example, you may want to enhance it and developp you own application running inside of Xhyp. For more information consult our licensing page. X-Hyp memory usage and constraints. If you want to port your own operating system to X-hyp you will need to use the X-hyp hypercalls to handle all access to hardware, CPU configuratio, MMU or MPU configuration and Cache configuration. To do this you may want to use the X-Hyp C Library interface or if you use another programming language the assembler hypercall interface. Follow the following link to the documentation on assembler hypercall interface. If you use C programming language to port your own operating system to X-hyp you can use the "X-hyp Library interface" to handle all access to hardware, CPU configuratio, MMU or MPU configuration and Cache configuration. Follow the following link to the documentation on C library interface.